Fleet of Constellation: 2x B727-200 (OO-CAH, OO-LLS), 3x A320 (OO-COF, OO-COH, OO-COL), 2x B737 leased from JAT (YU-ANI, YU-ANK), 1x A321 leased from BMI (G-MIDA). 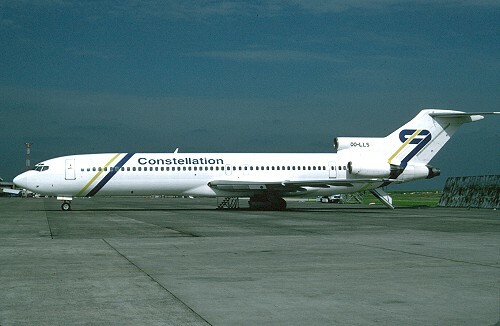 History: Constellation International Airlines was formed as Unijet on May 27 1978, changed its name to BFS International on October 28 1981, before changing to its current name on February 7 1995. On June 23 1995 the first B727-200 was leased, a couple of weeks later followed by a second airframe. On July 1 IT pax charters, mainly to Mediterranean resorts, were started from its Brussels base. In 1997 the noisy Boeings were replaced by a couple of Airbus A320, in 1999 another airframe was added. Some additional aircrafts like B737s and an A321 were leased from JAT & British Midland. The B737s of JAT were based at Palma providing IT charters to Germany, Italy and Greece. The A321 of British Midland was used to cope with the heavy demand in the Summer season of 1999. Financial troubles led to the ceasing of all activities on December 3 1999, and they were declared bankrupt on December 15 1999.